Rare flyer advertising the game. 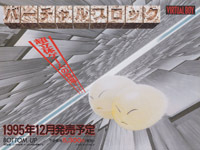 Virtual Block (バーチャルブロック) is a cancelled Virtual Boy game from Bottom Up. 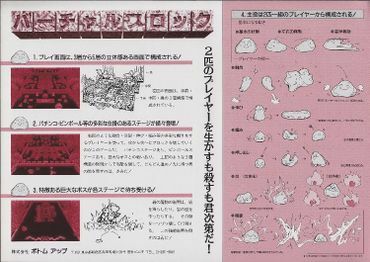 It was supposed to be released in December of 1995 in time for Christmas, but was cancelled due to the Virtual Boy's failure. This game would have played similarly to Arkanoid in that you had to bounce a ball off a paddle and hit blocks. The only difference in that mechanic is that the game would use two paddles, each controlled by the two D-pads on the controller. 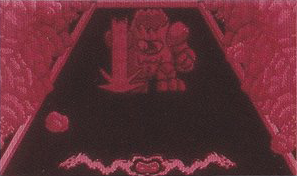 Each stage had enemies that you could hit with the ball. 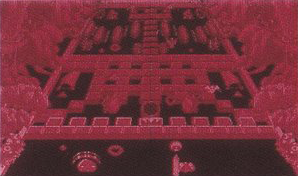 There would also have been boss stages, one featuring a giant tree stump enemy that would throw rocks. 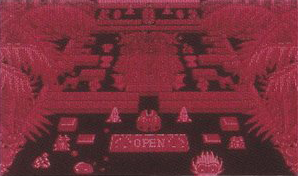 While no prototypes have been found, at least one likely exists as the game was shown at Famicom Space World 1995. Besides this, little information on the game can be found apart from a few screenshots and some advertisements.